Collection agencies are relentless about generating response. It’s their business. They’ll send letters and call you to get you to pay. They’ll even send Luigi to your house to re-possess your car if they have to. You see, they have a system. A process. And it works. In this article we’ll show you how to use these secrets of collection agencies to get response rates as high as 17% from your direct marketing campaigns. It can be done, and it is remarkably easy. Collection agencies are famous for sending a 3-step letter sequence to get your attention to respond. 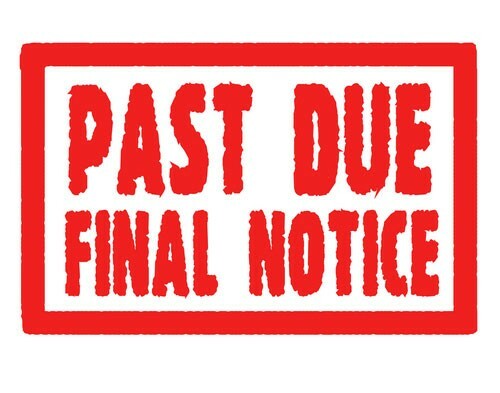 The first letter arrives from the junior collection agent, is professional, and requests payment with a deadline. If you don’t respond to the first letter, the manager sends off a letter with more terse language, a deadline and a penalty if you fail to respond. Finally, if you still don’t respond you get the dreaded Final Notice letter where if you don’t respond a fleet of muscles and moving trucks will be hauling away that big screen TV of yours. Imagine flipping this 3-step letter sequence used by collection agencies 180 degrees. Negative karma becomes positive karma. Now you have a winning marketing strategy to get your prospects to respond at unbelievable rates. First you need to have a very narrowly defined list to work from. Ideally 1,000 – 2,000 names max as anything more than this will make the project challenging to manage. If you live in the B2B world, recommend you select a specific SIC code in your market to target. For example, all attorneys or furniture stores. With this strategy you can select a vertical market, extract maximum response from that vertical and then re-apply this strategy to a new vertical market. If you are a B2C marketer, recommend you select a specific demographic to focus upon in your market. For example, if you are a family restaurant you might want to target all families with children in a specific zip code. Or if you are a window coverings company, a list of brand new home owners in your county. d. An expiration date in approximately 14 days. b. Copy similar to “A few weeks ago we sent you a letter offering you <Offer #1> and frankly we are shocked you did not respond. <Offer #1> offers you tremendous value such as <List of Benefits>. Because we know you will get tremendous value in doing business with us, we’ll also include <Offer #2> on top of <Offer #1> but you need to respond by <deadline>.” Of course, this would be wordsmithed as appropriate, but the essence is to link letter #2 back to letter #1 and then layer another compelling offer on top. i. Side note: Another very famous marketer uses this strategy well. You see it over and over again on television because it works. Do you remember the Ginzu Knife? c. Language in Letter #2 would be much crisper, using shorter sentences and less text, and would be more “to the point”. d. Letter #2 would be signed by a more senior person (i.e. VP of Sales). e. Both offers would have an expiration date in approximately 14 days. a. A “final notice” style of writing with a red stencil styled FINAL NOTICE stamp on the letter. Bonus points if your letter is on pink stationary (like a pink slip). b. Language similar to “We have tried and we have tried and we can’t believe you are still not responding. We offered <OFFER #1> and you didn’t respond. Then we threw in <OFFER #2> and you still did not respond. Because we know we can provide you <List of Benefits> we will throw in a FREE <OFFER #3> if you respond by <date>.” Again, this can be wordsmithed further, but this is the essence. c. Letter #3 is only 1-2 paragraphs. Very, very short. d. Letter #3 is signed by President. When this 3-step sequence is complete, you can count on these prospects really understanding that you exist. The rapid-fire repetition of 3 touches in a 45-day window will help you break through the clutter of direct mail that they receive each day. And the incremental cascade of offers, especially if written in a fun and entertaining way, will create a mini buzz in the community where your prospects will talk to their friends (i.e. you won’t believe these letters I was getting from <company>). In the world of direct marketing, a 1% response rate is generally considered good. Clients that use this 3-step letter sequence have been able to generate response rates in the incredible 10-17% range. There are cases where the response rate has reached unheard of 45% response rates. This notion of sequencing your letters with tight expiration dates and prospect behavior observations is a fantastic example of “Marketing to the When”. 1. Pick a narrow and manageable target audience of ideally 1,000 – 2,000 names. If you are B2B, select a single vertical market (i.e. dentists). If you are B2C focus on a specific geographic/demographic segment (homeowners with income above $75,000). 2. Launch your 3-step sequence with military precision. 3. Pay attention to who responds and who does not. Keep your database up-to-date. 4. Reap the rewards of your campaign and then move on to your next target audience. Special thanks to marketing guru Dan Kennedy for sharing this 3-step letter sequence concept in one of his bootcamp seminars that I attended at the San Diego Convention Center in the mid-90’s. Dan Kennedy is a very innovative marketer and copywriter and I encourage you to seek out his publications on the Internet. I’ve tried this 3-Step Letter Sequence process both for clients and my own business and it works. It really works.